There is something about witnessing cherry blossoms in their peak, every spring. As cliché as it sounds, their essence always takes my breath away. I find myself drifting away from my bustling thoughts when I am gazing into their simple yet intricate details. How could a cherry blossom hold so much weight? Homaro Cantu, an American chef and inventor who is famously known for molecular gastronomy, explains “The significance of the cherry blossom tree in Japanese culture goes back hundreds of years. 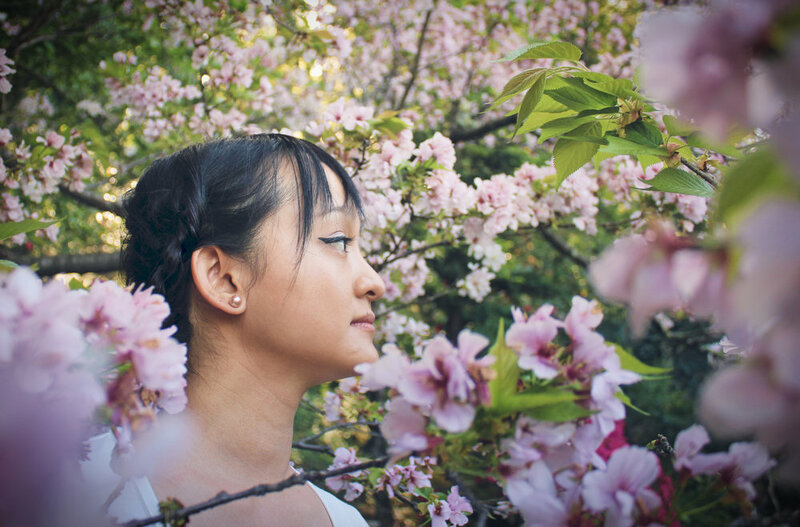 In their country, the cherry blossom represents the fragility and the beauty of life. It's a reminder that life is almost overwhelmingly beautiful but that it is also tragically short.” Although Cantu’s message is a bit dismal, it is honest on how one’s life is only temporary. Thus we should continue to enjoy our lives, the opportunities, and the moments with our loved ones that are presented to us, since tomorrow is not promised. On a happier note, I would love to see the cherry blossoms in Japan and Washington D.C. in the next few years. For the duration of this year’s cherry blossom season, I’ll just live vicariously through pictures and my social media feed. Do you guys have any other must see cherry blossom locations? Let me know in the comments below. I first heard the phrase “Kimi Ga Suki” in a song, and was curious on the translation and meaning. “Kimi Ga Suki” translates to “I like you” in Japanese. With Spring in full force, I felt it was fitting to call today’s lookbook “Kimi Ga Suki” to welcome Spring and new beginnings on the Crystal Avenue with open arms. I decided to challenged myself to stray away from defaulting towards darker colors. To start, I chose to put my hair into a crown braid for a boho vibe, and styled my baby pink skirt from Bebe with a basic short sleeve cami from H&M. I decided for “Kimi Ga Suki,” to be more on the simple side and less flashy than my previous looks, to play with basics and to allow my surroundings to steal the show. As always, I love to color block and chose to color block with my accessories. Have a good rest of your week and I’ll see you all soon!